I'm posting only occasionally here on Inside Stories. 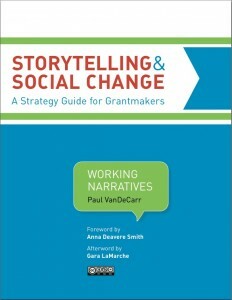 Mostly, I've been busy doing webinars and presentations about my guide on "Storytelling and Social Change" -- aimed primarily at foundations, but also useful for media-makers, nonprofits, educators and others. It's published by my organization, Working Narratives. Click the link for a free download of that guide. I've also taken up posting every Wednesday on the Working Narratives blog, which concerns social-justice storytelling. I'll mostly be blogging there mostly, and only occasionally here at Inside Stories. So please go bookmark that page or join Working Narratives on Facebook and/or Twitter. But please do keep an eye on Inside Stories for occasional special features! Thanks for reading!